Labor Day is here and the college football season started with our local Big 10 team Northwestern scoring an upset win over a ranked Stanford team. Next weekend is the first full weekend of NFL football with my Green Bay Packers visiting Soldier Field where they should continue their winning streak over the hapless Bears. While all eight of these items are critical financial planning steps to be tended to or at least reviewed this year or in any year, the environment in the financial markets has changed from this time a year ago. August and so far early September has proven to be a rough patch for the stock market with much volatility and pronounced drops from highs reached earlier in 2015. The financial press is filled with stories about what to do and this has become a major event for the cable financial news stations. In this context here are a few thoughts regarding some financial planning steps for the rest of 2015. To me a comprehensive financial plan is the basis of an investment strategy and frankly all else in your financial life. If you have a plan in place, revisit it. 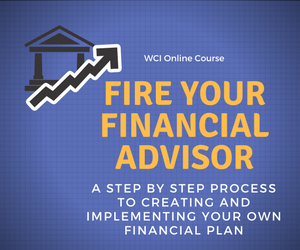 If you don’t this is a great time to find a qualified fee-only financial planner and have one done. Where are you in terms of financial goals like retirement and saving for your children’s college education? Do you have an estate plan in place? With the markets taking a breather this is a good time to see where you are and what it will take to get you where you want to be financially. An investment strategy is an outgrowth of your financial plan and this plan is something to fall back on in times of market turmoil like the present. How has the recent market decline impacted your asset allocation? Does your portfolio need to be rebalanced? Is your asset allocation consistent with your goals, risk tolerance and time horizon as outlined in your financial plan? While I don’t advocate making wholesale changes to your portfolio based on some temporary stock market volatility it is always appropriate to do a periodic review of your overall portfolio, your asset allocation and the individual holdings in your accounts. These include mutual funds, ETFs, individual stocks and bonds and so forth. The recent weakness in the markets may have created some opportunities for year-end tax loss harvesting in your taxable accounts. This refers to selling shares that show a loss to realize taxable losses. If you want to do this but also want to continue to own these or similar investments be sure to consult with a financial or tax advisor who understands the wash-sale rules. More likely you have many investments that have appreciated nicely and these represent and excellent vehicle to make charitable contributions. Not only do you receive a tax deduction for the value of the gift, but you eliminate the tax liability for any capital gains on the holdings. The current situation in the stock market is a good time to check your account and rebalance your holdings if needed. Better yet if your plan offers it sign up for automatic rebalancing so you don’t have to worry about this. Fall open enrollment is often the time when companies roll out any changes to the plan in terms of the investments offered, the company match or other aspects of the plan. Additionally most plans were required to issue annual disclosures by the end of August so be sure to review yours to see where the investments offered are compared to their benchmark indexes and how much they are costing you. Lastly check to see how much you are contributing to your plan. If you are not tracking toward the maximum salary deferrals of $18,000 or $24,000 (for those who will be 50 or over at any point in 2015), try to increase your contributions for the rest of 2015. Labor Day is here and summer is unofficially over. Use the remainder of 2015 to tackle these issues and to get your financial situation where it needs to be. Check out Carl Richards’ (The Behavior Gap) excellent book The One Page Financial Plan. Carl is a financial advisor and NY Times contributor. This is an easy read and offers some good ideas in approaching the financial planning process.